In Liturgy this is sung three times, but to our little soprano Autumn, it is never-ending and she sings it until she is lulled to sleep by her prayer. My husband and I and our little family of four children are Catechumens in the Orthodox Church. We attended our first service together about two years ago and began catechism last summer. 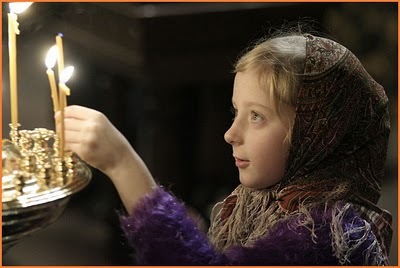 We have many reasons for wanting to become Orthodox and one of the primary reasons focused on our children. We want our children to fully participate in and to enjoy their Faith. I was raised in a traditional Protestant church and spent my college years in a more modern evangelical church. 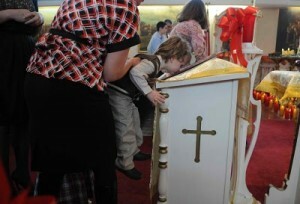 In my experience, children do not participate in the worship of the Church. Instead, they are whisked away to be baby-sat in the nursery or in children’s church so that the adults can enjoy a little “time off” and focus on the sermon. Depending on the denomination, children may or may not be baptized as infants (most evangelicals do not baptize infants). Children are not permitted to receive the body and blood of Christ in Holy Communion. Many churches have bare walls, which leaves the child’s eyes and mind to wander in imagination and boredom until they start to misbehave. All that is left in worship for the child’s senses is hearing. It doesn’t take much for a parent to understand that children don’t hear very well. It may take me telling the children three times (very Orthodox ?) that their shoes belong in the shoe basket before they understand what to do with their footwear. For a child, going to a church where hearing is the only sense they can use in worship is flat out boring. Maybe they get their eardrums rattled by some loud music for the first twenty minutes (my children don’t like Evangelical praise music – they say it hurts their ears and gives them a headache), but then either they have to listen to a boring grown up drone for thirty minutes or maybe they get to go color pictures to pass the time in children’s church. In the Orthodox Church, there is no praise team dressed in the latest fashion and performing for an audience. We sing the entire Liturgy with no guitar, drums, piano, or organ. There is little variation in the hymns we sing. Most of our Liturgy is the same each week. Children need repetition-they thrive on it. They need and want to know what to expect because then they feel secure. Also, the Liturgy is packed with Scripture and what better thing is there to repeat every Sunday? A few years from now my children will know a lot of Scripture simply because we sing it in Church each week. Except for Lent, there are bells on the censer (which I will talk about in a bit) which is used quite frequently during Liturgy. Whenever the censer is used, its bells jingle and draw attention from adults and children alike back to the worship of the Church. What does your church smell like? I never thought that a church could have a certain smell to it, that is, until I first visited an Orthodox Church. My oldest daughter Grace, age four, has a very keen sense of smell. After we had been visiting an Orthodox parish on a regular basis we bought some incense to use at home. The first time we lit it, Grace came into the room, put her nose in the air and took a big whiff. My husband asked her what it smelled like and her simple reply was “Jesus.” Orthodox worship uses incense which is placed in a censer that has bells on it and the incense symbolizes our prayers ascending to God as in Revelation 5:8 and 8:3-4. The altar, the holy gifts (communion), icons, Gospel book, and the worshippers themselves are censed by the priest. One of the reasons for doing this is to recognize and honor the icon of Christ in each person. When you smell your favorite food cooking what do you think of? Your stomach! What do you think of when you smell smoke? Fire! What does a child, or perhaps even a blind or deaf person think of when they enter an Orthodox Church and catch its inviting fragrance? They become aware that they have entered a holy place filled with sacred things. Orthodox Churches are very beautiful to me. When I entered one for the first time I was astounded by all of the beautiful things that were held inside. A child could never get bored with so many wonderful things to look at. Beautiful icons adorn much of the wall space. The priest is wearing vestments which are beautifully sewn and decorated. There is a gold or silver Gospel book on the altar. And of course there are lots and lots of candles. There are so many things to see that a child could stand captivated by all of the beauty that he would forget about misbehaving. Children are very visual-especially boys! It saddens me when I visit other churches to see that they have stripped their walls bare, leaving children to find other things to do. Instead of bringing beauty back into their churches they sweep these precious souls away from where they most need to be: in church! As a parent, I am responsible for the spiritual well-being of my children. As I said early on, one of the primary reasons for our wanting to enter the Orthodox Church is for the sake of our children. 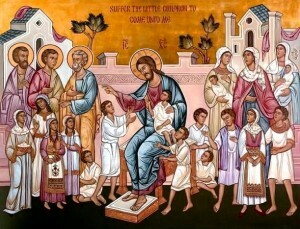 If you have children and are tired of them being pushed to the backburner in church, then take them to an Orthodox Church where children are full members. Watch them grow in Christ right along with you.